After engraving on a sheet of Laser-it anodized aluminum, there's smoky film. I've tried various ways to clean it, but most of the time it scratches. 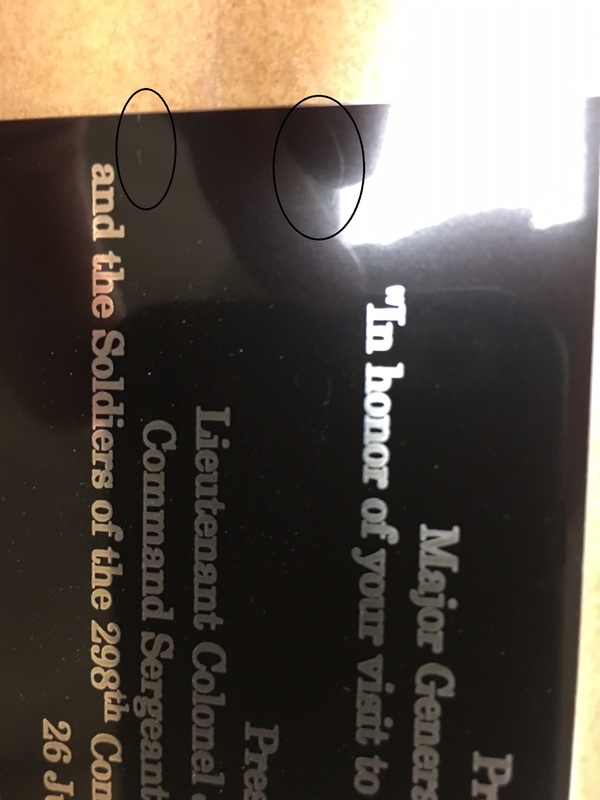 Does anybody engrave and have a good solution? I've used tissues, techwipes, paper towels, toilet paper, etc. I just had a piece engraved. The guy cleaned it with paper towel and rubbing alcohol. I mean I'm using tissue paper and such and it's scratching it. I don't know what to do. I usually run it a few times and use the one that doesn't happen to scratch. Would it be the same principal as plastic glasses that you never use a paper product to clean as it scratches,fogs then? Always use a soft cloth ? It may be. What's weird is I can't find a solution anywhere, even though it's the most commonly used product in engraving. I mean trophies and plaques etc. I may see about getting a microfiber cloth somewhere and see if that'll work to clean it after engraving. Hard to see I guess but here's a picture. They're small, but I don't want any scratches. You need to look into getting a better product. Anodized aluminum shouldn't been scratching like that if it's done properly.